Wal Thornhill wrote: Answer: The three theories above demonstrate blind ‘faith’ in the idea that the planets were formed from a nebula as one ‘family,’ roughly where we see them today. There is no scientific reason to adhere to such a belief while there is an avalanche of data from space to contradict it. We do not know that Mercury has a high density. There is no need for far-fetched scenarios involving the early Sun or a colossal impact. Planet and star formation by gravitational accretion has never been observed and it cannot be shown to work in theory. “There is a general belief that stars are forming by gravitational collapse; in spite of vigorous efforts no one has yet found any observational indication of confirmation. Thus the ‘generally accepted’ theory of stellar formation may be one of a hundred unsupported dogmas which constitute a large part of present-day astrophysics.” —Hannes Alfvén, G. Arrhenius, Evolution of the Solar System, NASA 1976. From an electrical standpoint we make the simple observation that increasing electric current input to stars results in increasing maximum rotational speeds. There are several rotational anomalies in our solar system for which mainstream has no explanation or has to resort to coincidence. Each time Venus makes its closest approach to Earth (this position is called inferior conjunction), the same face of Venus looks toward Earth each time. These inferior conjunctions occur repetitively at precisely five specific points in Venus's orbit. This is what engineers call a "phase lock." Also, another rotational anomaly of immense interest. Has the rotational period of Saturn slowed down in recent years as measured by space probes? or are these enigmatic results due to inadequacies in measuring techniques? Cassini took readings of the day-length indicator regarded as most reliable, the rhythm of natural radio signals from the planet. The results give 10 hours, 45 minutes, 45 seconds (plus or minus 36 seconds) as the length of time it takes Saturn to complete each rotation. Here's the puzzle: That is about 6 minutes, or one percent, longer than the radio rotational period measured by the Voyager 1 and Voyager 2 spacecraft, which flew by Saturn in 1980 and 1981. Cassini scientists are not questioning Voyager's careful measurements. And they definitely do not think the whole planet of Saturn is actually rotating that much slower than it did two decades ago. Instead, they are looking for an explanation based on some variability in how the rotation deep inside Saturn drives the radio pulse. "I think we will be able to unravel the puzzle, but it's going to take some time," said Gurnett. "With Cassini in orbit around Saturn for four years or more, we will be in an excellent position to monitor long-term variations in the radio period, as well as investigate the rotational period using other techniques." This could warrant further investigation. A simple analysis of solar system dynamics shows that the rotating nebular disk hypothesis is inadequate. The greatest mass is of course near the solar centroid, yet the greatest angular momentum is far from the center. Other so-called "anomalies" such as nick c described demonstrate practical proof that the nebular scenario is wrong. How things got started, and how they keep going are related questions, even if the answers are incongruous to each other. Gravitation certainly plays a part here, there's no question about that for me, but what causes gravitation is a question with nearly as many answers as there are contributors to this forum... probably more. I for one believe gravitation is a natural outcome of the unified field that is equally responsible for ES and EM forces, atomic/nuclear forces, and even the Casimir effect, as well as for the phenomenon of light. Did this unified field preoccupy the universe before matter? Or is the field somehow an attribute of matter? Again, I lean toward the former view. Does matter and space somehow oscillate through time? Or have the fields and their associated particles [insert your favorite definitions here] existed eternally? The big bang certainly raises more questions than it answers. But do we throw out ideas simply because they are based on assumptions? The idea that the universal system has always operated this way is just as much an assumption as "God created...". Let's be careful not to judge an explanation as nonsense simply because we don't like the implications of the assumptions behind it... if concepts are based on evidence, or attempt to correlate a wide array of evidence, as well as provide some predictability about yet undiscovered phenomena, then let's entertain these openly. Post-modern science tends to look at individual bits of the universe without considering their relationship to the whole. To answer the thread question directly, I would answer [in my own simplistic manner] that the "holding" force of the universe and the "life giving" force of the universe are mostly in equilibrium, providing motion and stability to every observed system... where others see chaotic assemblages of material randomly distributed, I see "crystalline", orderly, fractal, scale-less unity. I attribute the origin of these forces to a Designer, because I see order beyond what can be explained by determinism or materialism. That idea may be odious to some of you looking for a more mechanistic explanation. But as bdw000 said, until a time machine is invented, were all stuck with the universe as it is now, the true limitation of science. where others see chaotic assemblages of material randomly distributed, I see "crystalline", orderly, fractal, scale-less unity. I attribute the origin of these forces to a Designer, because I see order beyond what can be explained by determinism or materialism. This apocryphal story relates to Isaac Newton's supposed belief in design. Newton, a man of his time, engaged with friends in frequent discussions on the subject of God and design. An atheist friend disputed the evidence of design in reality. The story goes that Sir Isaac then built a clockwork model of the Solar System, including all the planets and moons that were known at the time. The moons revolved around the planets and they all in turn revolved around the Sun, while each individual orb turned on its axis. "How were you able to construct such an ingenious device?" asked the friend. "I just tossed the pieces at random into a corner, and they accidentally assembled themselves into this model," Newton replied. "That's absurdly impossible," protested the other. "A lot less absurd," countered Sir Isaac, "than your belief that such was the origin of the real Solar System, of which this toy is but a much simplified model." “ Gravity explains the motions of the planets, but it cannot explain who set the planets in motion. God governs all things and knows all that is or can be done. This most beautiful system of the sun, planets, and comets, could only proceed from the counsel and dominion of an intelligent Being. … This Being governs all things, not as the soul of the world, but as Lord over all; and on account of his dominion he is wont to be called “Lord God” παντοκρατωρ [pantokratōr], or “Universal Ruler”. … The Supreme God is a Being eternal, infinite, absolutely perfect. I think that the same cause for the planetary and stars rotation is the same makes to rotate the galaxies. 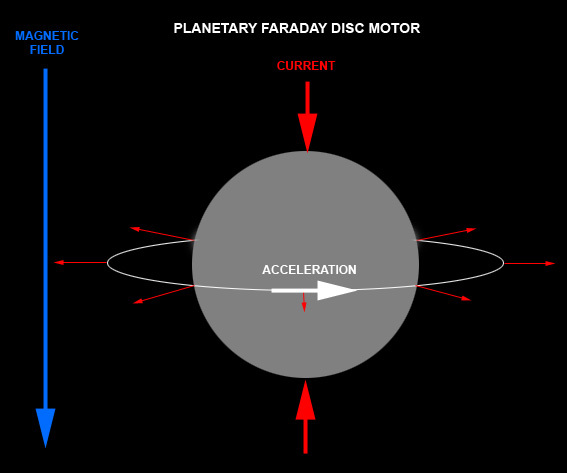 And in the EU theory the only way that we know is the Faraday disk motor. What happened to the 90 degree orientation of E-current to M-field 'lines' ? - Speaking of God, God = unlimited consciousness etc. - In discussion of Stephen Crothers' reply to a blackhole article in Nature, a forum member said, "At the foundation of modern physics there is no foundation. ... The weirdness of modern physics is considered to be the natural outcome of good science, when in fact it is a very bad form of metaphysics." - So I said it seemed like a good time to start discussing what is a good foundation for physics. - I'm almost 60 now. Shortly before my 20th birthday I came to ask myself what I know for certain. I'd had a year of college physics from which I learned of the claim that there are 5 basic units of reality: space, time, mass, temperature and electric charge. So I asked if I know any of that for certain. I had to answer tentatively no, that I was not certain. - So the next thing I thought to look into was the idea of KNOWING itself. I asked if there's anything about knowing that I'm certain about. I found in a dictionary that knowing means awareness, which is consciousness. And I could immediately see that I'm certain that at least my immediate consciousness is real. I was also able then to realize that consciousness consists of perceptions, emotions and thoughts, and lately I've concluded that the subconscious, the will and time are also aspects of this consciousness [I consider the subconscious to consist of memories, reason, will and dreaming, because I don't seem to be conscious of these, except vaguely]. - So TIME is part of conscious awareness. Perceptions, emotions and thoughts etc always have a time aspect. - SPACE does not seem to be part of all of my consciousness, but only part of the perceptions [or senses] of vision, feeling and hearing. - I'll call this perceptual space P-SPACE. I define p-space as any aspect of perception having LENGTH, AREA, or VOLUME. - The 2 types of P-SPACE seem to be MATTER and VACUUM. Types of MATTER include SOLID, LIQUID, GAS and PLASMA. MATTER seems to consist of EM FIELDS and SUBATOMIC PARTICLES, as well as VACUUM between these particles. Types of VACUUM seem less clear to me for now. VACUUM = P-SPACE without matter? - Can we agree that this is a proper foundation for physics on which we can build a sound structure? The faraday motor discussion is most enlightening. That was my underlying guess when I initiated this thread. I wondered if any multiple terella globe experiments have been initiatied to determine if there is a torque imparted on the smaller of the two suspended globes. Love the galactic section, it certainly is applicable to the EU model that rotation is inherent to any scaleable structure. electron ----atom---- moon- planet ---galaxy. Just thinking about some of the retrograde rotating moons and oddity of neptunes rotation, Could there be a different electrical flow causing these odd rotations. As far as I have seen in my searches, I have not come across any information that would describe a mechanism for these rotations. This [url2=http://www.thunderbolts.info/forum/phpBB3/viewtopic.php?f=4&t=1022&start=0]thread[/url2] in the Planetary Science forum has a lot of interesting information on planetary rotations, although I don't think that there is any discussion of reverse rotations. This is a important question. One that leaves most stumped. True knowledge is the ability to answer this question and relate it to all other spins. The Spin Domains begin at the level of Primary Angular Momentum. This would seem to be nothing on its own, merely Angle. Angle with Velocity then creates Primary Angular Momentum and which develops Frequency or is created by Frequency which creates Resonance. Compton WaveLength, Planck Length, Speed of Light, and their relative relationships would be the lower limits of these Units and Domains. The Great Attractor is the best fixed frame of reference to examine Spin Domains on a Galactic Scale. The two levels, Quantum and Fixed Point in the Universe as our greatest spin reference frame, must have perfect balance and be intrinsicly harmonicly coupled. The holistic approach favours this view. The exploration of the sacred numbers involved in these dynamic spin domains are infact related and do indeed have harmonic relationships that govern music, art, geometry, natural forms, and all the rules of physics. Spin is the answer to all knowledge. Spin can be argured over till the cows come home, but the sooner you can identify the harmonicly coupled spin relationships to each level the sooner you will see the big picture. The cyclic nature of frequency requires a galactic and universal Push/Pull as its Driver. The universe is nothing without its harmonic spin relationships. It is dependent on these relationships and cannot exist without them. You can find links to these ideas on this page here. Numerology, Vortex Magic Cubes, Synergetics, Tensegrity, Prime Number Code, Holotomic Numbers. Each one interconnects to fully reveal the relationship to spin and all cyclic patterns in nature and the universe. The understanding of frequency, spin, harmonics and how these couple is the resonace of the universe. This is the importance of spin. Many debates here have occured over spin. Is it a dimension, is it intrinsic, is it a noun, (yes it is especially in physics). Therefore it is a "thing" and not a device of the human mind. Leave it unresolved at your own peril. As you rightly asked what spins the planet. Infact the relative velocities of each domain are haromonicly linked and thats what you discover as you learn the list of concepts I referred to. I can tell you off the top of my head the relative velocites of each spin domain. I know them because they related harmonicly. Its a good thing to know and comprehend. Last edited by junglelord on Wed Oct 29, 2008 8:01 pm, edited 3 times in total. junglelord wrote: The Spin Domains begin at the level of Primary Angular Momentum. Is there a difference between "Primary Angular Momentum" and the "Curvature of Space-Time"? Maybe it's just me but they both sound the same; two different ways of saying the same thing. The structure of space is related to its E field, H field, Cosmic Frequency and its Quantum frequency. This curvature of space is due to the relationship of Mass to the Structure of Space or its Radiation Field Pressure and how these fields converge and diverge on the object of Mass. The effect called Gravity would be a shadow effect from these two frames of reference related to the planets velocity and Mass. Primary Angular Momentum exists within the Aether framework as a seperate gyroscopic function at the quantum domain. Not being very familiar with fluid dynamics (and could not find an explanation) could anyone suggest an article explaining causes for the solar “differential rotation”. Just as the earth's surface has its 7.3Hz speed of light resonance, the sun and earth also has a light speed resonance it seems. I would look at the cyclic nature of the phenomenon. The secret is in the Numbers and the Frequency. We are looking at a Harmonicly Coupled Z Pinch. Fluid Dynamics will be dictated by the Frequency. As Michael always says, its Current that makes Magnetic Fields. Well its Frequency that drives it all. The understanding of the Spin Domains is a simple issue if your willing to accept it. However it involves terms that are considered Metaphysics. Sacred Geometry, Numerology, Vortex Magic Cubes, Casting Out Nines, Prime Number Codes, Holotomic Number Sequence. It all goes back to a 3-D Relationship of Grammer, Single Digit Numbers (for the most part). How we understand 3-D both with Numbers and Terms or Definitions. Frequency is a Harmonic Key to all relationships. Each relationship is governed by Structure and Function. The Structure and Function is governed by the Vector Equilibrium Matrix. Buckminster Fuller evolved 99.99% of this with his Synergetics. I was a student of Tensegrity for 15 years as well as a Teacher and Medical Practioner. Synergetics is Tensegrity taken to the final level and therefore is the basis for Tensegrity.